There are numerous species of finch, but one of the most popular as pets is the zebra finch. This species is hardy and relatively easy to care for, so it is an excellent choice for the new owner. Zebra finches are normally kept in pairs and entertain themselves without a lot of interaction with their owners, making them a good choice if you don't have a lot of time to spend with your birds. Other finches are more brightly colored, but few are easier to keep successfully than zebra finches. 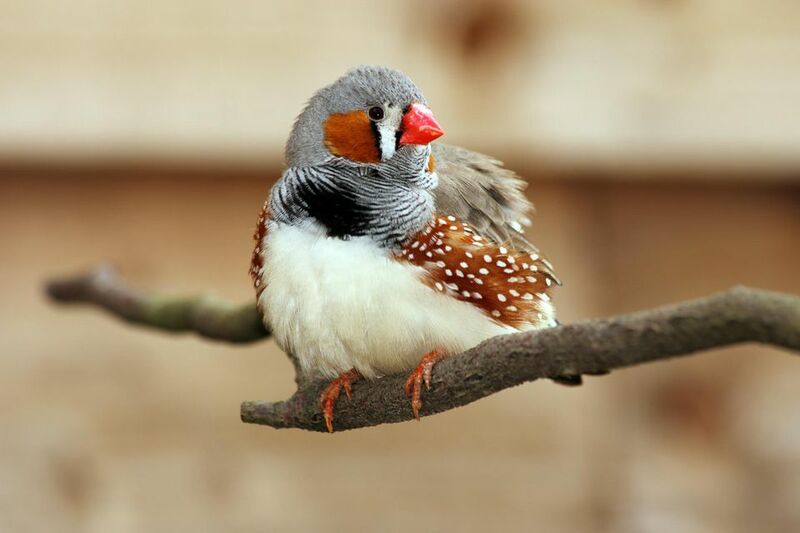 The zebra finch is sometimes also called the chestnut-eared finch and the spotted-sided finch. Australian Aboriginal names include Nyi-Nyi and Nyeen-ka. Zebra finches are natives of the arid areas of central Australia and still exist there in large flocks. They can also be found in Indonesia and East Timor. The zebra finch has also been introduced into Costa Rica and Portugal, where wild flocks now exist. The preferred habitat includes a range of grasslands and forests, preferably close to water. A mature zebra finch is about 4 inches long from the tip of the beak to the end of the tail feathers, making it one of the smaller (though not the smallest) of the finches. In general, finches have an expected lifespan of anywhere from 3 to 15 years, although 3 to 5 years is typical. The wide range here can probably be attributed to species differences as well as an increased understanding of their husbandry, especially diet. Zebra finches are small birds and are active and fun to watch, but quiet when it comes to vocalization (its chirps and peeps are easy to tolerate for most people). Although small, the zebra finch needs a fairly large cage in order to have flight room. All finches are social and should be kept in pairs—and a male and female pair will usually breed quite readily so you may want to consider keeping only females. Some people recommend keeping them either in pairs or in groups larger than six. Of course, if keeping more than a pair, you will need a larger cage such as a flight cage or aviary. While they are social with each other, zebra finches are not birds that bond strongly to people (although they do become quite tame). They are good for watching but not for handling. Zebra finches are attractive birds and they are dimorphic—males are easily distinguished from the females. In a native environment, the males have black and white bars on the throat and breast, orange cheek patches, and brown on the sides of the body. Females don't have these features and are instead gray in these areas. Both males and females have red-orange beaks, although the male's is much brighter in hue. A wide variety of color mutations are now available in captive-bred birds. When keeping zebra finches, the height of the cage is not as vital as having room to fly horizontally, so a long but short cage is acceptable. It is a good idea to get the largest cage you can—30 inches long, 18 inches high, and 18 inches wide is a good size for a pair of zebra finches. If you are going to get a larger group, you'll need an aviary or flight cage. This can be home-built, but keep in mind that excellent hygiene is a must, so any cage should be easy to clean. Wire spacing should be 1/4 inch to 1/2 inch. Supply a variety of perches, but make sure the cage is not so cluttered that the finches cannot fly back and forth. For perches, you can use dowels in a couple of different sizes, or add some natural branches, perhaps angling them to provide variety so their feet are not always holding onto the perches in exactly the same way. A few small clip-on perches can offer a little privacy in an aviary situation since only one or two finches can sit on them at the same time. If possible, provide some plant cover at the perches to allow for privacy. You can use silk plants or non-toxic live plants. Swings and ladders can also be provided, although ladders are more likely to be used as perches than for climbing. Small bells or hanging toys can also be included, although finches are generally not very interested in toys. You'll want the finch cage in a quiet, secure location in your home (although in warmer climates finches can be acclimated to outdoor aviaries). Finches tolerate a white range of temperatures but avoid placing them in direct sunlight or in drafty areas near heat- or air-conditioning ducts. Finches do not crave social interaction with people so, unlike parrots, they do not need to be in a busy social part of the home. In fact, they will probably be less stressed if kept in a quiet corner. Provide fresh drinking water daily. Some keepers prefer tube-style water dispensers, while others use dishes either attached to the cage (with perches for access) or on the floor (place away from perches to reduce soiling with feces). Whichever you use, make sure there is always a supply of fresh clean water available, and clean the water dishes daily. Food dishes can also be placed on the floor (not under perches, of course) or attached to the side of the cage. Again, these need to be cleaned daily. A shallow dish of water should be provided several times a week for bathing. The water in the bath should be clean, so remove the bath water as soon as it becomes soiled. Some people use full spectrum lighting for their finches. This is helpful especially in controlling molting and breeding behavior, but it isn't strictly necessary for the average pet zebra finch. Feed your finches a good-quality finch seed mix, although this should never the sole diet. Check to make sure that the seeds are fresh by sprouting them (put some in a plastic bag with a damp paper towel)—if they will not sprout, then the seeds are too old to feed. Feeding them sprouted seeds is an excellent way to boost nutrition, as the seeds are at the peak of their nutritional value at sprouting. Millet sprays are a favorite treat of many finches but offer them sparingly to prevent the birds from developing a preference for millet to the exclusion of other foods. A variety of green should be provided, including romaine lettuce, dandelion greens, kale, and spinach (in moderation), along with a variety of fresh vegetables and fruits (NO avocado, though). Experiment to find what they like and keep offering a variety, as it may take your finches a few tries to accept new food items. Remember, though, that serving sizes of these foods should be small. Pellets offer excellently balanced nutrition and are nice to offer as part of a varied and balanced diet. Be sure to get good quality pellets especially formulated for finches; you may need to be persistent in getting your finches to accept them. Eggfood is a supplement that is very important for breeding birds but it can be fed in moderation to non-breeders as well. You can buy a commercially prepared egg food supplement or prepare your own. Some sort of calcium supplement is recommended and a cuttlebone is an easy way to add calcium to the diet, as are crushed oyster shells or even eggshells (heat thoroughly before crushing to prevent salmonella contamination). The role of grit is still highly debated when it comes to finches. Many avian vets now recommend no grit for finches, as they do hull their seeds. If you do feed grit, only offer a few granules at a time and at infrequent intervals, especially mineralized grit. These small birds get most of their exercise from straight-line flights across the cage, as well as climbing on perches and branches. Provided the cage or aviary is large enough to allow some flight, they don't require much more in the way of exercise. Zebra finches can be prone to scaly face caused by mites, which requires treatment by a vet. Zebra finches are prone to air-sac mite infection, especially when overly stressed. This serious condition needs immediate veterinary care if the bird is to survive—if your bird has obvious difficulty breathing, seek help immediately. Otherwise, check out our profiles of other small bird species. Are Parakeets the Right Kind of Bird for You?